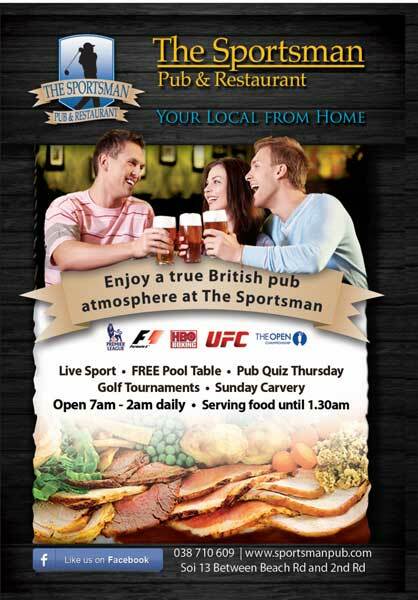 The Sportsman Pub and Restaurant in Soi 13, between Beach Road and Second Road, is one of the longest-running British-style bar restaurants in Pattaya, a fact that really does mean a lot in a tourist centre like this which has undergone some serious changes over the last decade and a half. The Sportsman is the kind of place where tourists come based on the recommendations of other travellers, whether via word-of-mouth or a simple search on the internet, and where expats and regular visitors also come because they know exactly what they’re going to get in terms of quality and service. Basically, the management of the Sportsman have been able to get the overall mix just right. First opened in 1997, the pub and restaurant underwent a major renovation a few years later with the end result being the layout and design so familiar to regulars today. For the British it really does offer a kind of familiar oasis so many thousands of kilometres from home. While the Sportsman Pub and Restaurant has a good quality pool table as a center piece attraction and there are seven large wall-mounted TVs scattered about in good viewing locations showing all sports as well as news channels, the operators have always been aware that it is the menu and quality of the food which brings customers through the door in the fi rst instance. So, the emphasis is on traditional English pub fare, with all the trimmings. The traditional Sunday all-you-can-eat carvery, for example, is often regarded as arguably the best in Pattaya. There is always fi ve roast joints, a special steak and kidney pie, Yorkshire pudding, and all the other elements one would expect of a carvery. A recipient of Trip Advisor’s Certificate of Excellence, the Sportsman prides itself on giving customers good, old-fashioned English-style dishes on decent-sized plates. There is, as one would expect, a substantial English-style all-day breakfast, while the fish and chips comes in the kind of golden batter that a ‘proper’ British diner would expect. In keeping with the desire to cover all potential bases, there is a children’s menu, as well as Indian curries, salads, pastas, burgers and some of the best and most substantial desserts for the sweet-toothed of any eatery in Pattaya. The daily specials change every two days, with the details posted on Facebook. Given that many expats and regulars are in relationships with locals, the Sportsman has a broad Thai menu to cater to those partners, or for tourists who might like to sample Thai cuisine in a more sedate setting. The Sportsman has a good reputation as well for its outside catering services, supplying bars and nightspots with specialty buffets for many years. When it comes to alcohol, The Sportsman has a great selection of local and imported beers as well as four beers on draught – Guinness, Heineken, Tiger and Thatchers Gold cider. All spirits are available and there is a decent wine list. There are beer specials every weekday. For their regular expat customers and tourists alike The Sportsman provides a selection of Daily International Newspapers supplied through NewspaperDirect to further enhance that home away from home feeling. The public face of The Sportsman is Dave Bowers, who has been in Thailand since 1990. He ran the Horn Bar in Walking Street for five years, became a partner in the Sportsman in 2002 and, with others, opened Door 2 Door the following year, acquired Waiter On Wheels in 2010, and the popular Robin’s Nest a couple of years ago. Away from the food and drink, the Sportsman Pub and Restaurant hosts a weekly free-entry quiz on a Thursday evening, starting at 9:00pm. There is free pie and chips for all contestants at the end of the fun quiz, and a rollover jackpot question. For the more energetic, Wednesday sees the Sportsman Golf Society come together and trek off for a day at one of the numerous courses dotted around the outskirts of the city. Of course, after a day of chasing a little white ball through bunkers and fairways, it’s a nice way to round off the activities by repairing to the Sportsman for a few beers and a substantial feed. So to enjoy a truly warm welcome from Dave and all the team and experience a true British pub atmosphere, drop in to The Sportsman on Soi 13, Pattaya (between Beach Road and Second Road).